Dr. Hugh F. Frame, 93, passed away on Saturday, March 23, 2019 in the comfort of his beloved home of 56 years on the St. Lawrence River. 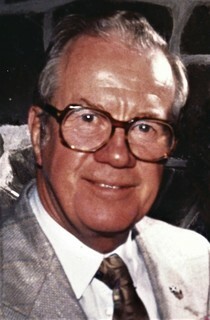 He was born May 28, 1925 in Newport, Scotland, the son of Reverend Hugh F. Frame and Jean MacIntyre Frame. His primary and college educations were completed in Scotland. In World War II, he served in the Royal Air Force as an air gunner in England and North Africa from 1943-1945. At the end of the war, he was reassigned and trained as a laboratory technician serving a further two years in England. In 1947, Dr. Frame received an honorable discharge and entered Medical School at Glasgow University, Scotland graduating in 1952 with Distinctions in Physics and Pathology. He then completed internships in General Medicine and Bacteriology and entered training in Pathology in 1955 in Glasgow. In 1959, he immigrated to the United States and completed further training in Flint, Michigan becoming Board Certified in Pathology in 1960. At this time, he also did Forensic Pathology work for the Medical Examiner’s office in Flint for a period of 8 months. In 1962, Dr. Frame came to Ogdensburg as pathologist to A. Barton Hepburn Hospital where he worked for 28 years, retiring in 1990. Dr. Frame served as Director of the St. Lawrence County Laboratory and Director of the laboratories in E.J. Noble Hospital in Alexandria Bay and Clifton-Fine in Star Lake, the latter for 12 years. He was also the Health Officer in both Morristown and Ogdensburg over the course of his career. Dr. Frame was a Fellow of the College of American Pathologists. He held licenses to practice medicine in Michigan, Arizona, and New York. He was interested in aviation and was a Medical Examiner for the Federal Aviation Administration for many years as well as being a licensed pilot himself. He was an amateur musician and was associated with the Seaway Valley Community Band for a few years where he played trombone. In retirement, he was an avid reader, who loved spending time with family and friends and enjoyed his scooter rides on River Road. He was a private pilot and enjoyed cruising on his boat “Young Lass.” He wrote great letters and chronicled his family with painstakingly kept photo albums. Dr. Frame is perhaps best remembered as a long-time County Coroner, a position he served for 29 years. He is survived by his wife of 45 years, Roxanne and 3 daughters, Linda Frame (Mike Forman) of Charleston, WV, Stephanie (Rick) Donaldson of Lake Clear, NY, Molly (Jody) Williams of Ogdensburg, NY, and James (Laura Mitchell) Frame and grandchildren Donald Forman, Joshua Mallet, Sydney and Savanna Donaldson, Eli and Brady Bullock, Jorja and Abby Williams, and Jade and Iris Frame. Per his wishes, a service will be held at the convenience of the family. In lieu of flowers, donations can be made to the Patrick J. Murphy, Jr. Scholarship Fund, c/o Ogdensburg Free Academy, 1100 State Street, Ogdensburg, NY 13669. I am so sorry to hear of the passing of Hugh. I am so many memories of him as a young girl when I would go to your house with Molly. Sincere condolences to the entire family. We will miss his witty Scottish humor and his smile! We always had a chuckle visiting with Doc be it when he was boating or having a refreshment and his favorite wing night! You are all in our thoughts and prayers at this difficult time. We are very sad to hear of Hugh's passing. Roxanne and to all the Frame family. Roxanne and family, It was a sad message we got yesterday to learn of Hugh's passing. I have so many memories of Hugh and nights in Brockville, Christmas parties at our house, and the laughter and fun he brought to any gathering with his great Scottish wit. May your many memories of happy times sustain you during the sad moments. Our thoughts and prayers are with you all. RIP, Hugh! Its a rare treat in life to meet "a character". Hugh was one of those people. We knew him for such a short time but what an impression he left. I only wish we had known him longer. And you are a wonderful loving wife. Our hearts are with you and your family. My heart is full of sadness and wonderful memories of 'Doc' and all of the family members. It was his kind words (in his wonderful Scottish brogue) that got me through the difficult days of my husband Mike's passing. We were able to laugh about some descriptions in his autopsy report. Doc was a gem of a man. He touched many of his friends lives in a wonderful way. Rest in Peace my friend! Linda, Roxanne, Stephane, and Molly, i am so sorry for your loss. He will be missed dearly. He was like a second father to me in my younger years. So many fond memories of my weekend visits and the traveling i was so fortunate to be included in. Thoughts and prayers for the entire family. He was a great man and will never be forgotten. I’m so sorry for your loss Roxanne. He was a wonderful boss and teacher. Roxanne, I am sorry to hear about your husband, Hugh. My sympathy goes out to you. I was very sad to hear this news. Roxanne and family my sincere condolences. Hugh was a larger person in my life than he ever knew. I grew and learned so much from him. I respected him very much and was very lucky to have him as a teacher and a mentor. I will always remember him. I’ll bet him and I spent at least 300 hours in morgues alone working probably more. My first flight in a Cessna was with him. RIP my friend. Love to you family! Roxanne and Family, so sorry to hear of Hugh passing. I will always remember the many good times we all had together.He was a great guy and a wonderful friend. My sincere condolences to Roxanne and all of the family, Hugh was a pillar of the community and will be missed and remembered by all that knew him. May he rest in peace. When we bought the house next door to Hugh and Roxanne a little over 2 years ago, we never could have imagined the friendship that would grow. We quickly found out our new neighbors were well known and respected in the area. Everyone knows the Frames. They are the best neighbors we could have asked for. In that short time, we have so many memories of Hugh that will never be forgotten. His joke telling, his vast knowledge and life stories are immense and will be dearly missed. We treasure our visits and laughs. Thanks to Roxanne's devotion to Hugh, it allowed us all extra time with him. Part of the charm and draw of the St. Lawrence River is gone and will never be quite the same. We hope to see you again some day Hugh and will miss you. Sending our deepest Sympathy and prayers to Roxanne, Linda, Stephanie, Molly and their families. So very sorry to hear of your loss...prayers for your family at this difficult time. My heartfelt condolences to my friend Linda, Dr. Frame's daughter, and to the entire family. Despite the grief of losing him, I am certain you are finding much joy in celebrating his amazing life. I’m so very sorry for your loss. I only had the pleasure of talking to Hugh a few times and I regret there weren’t more. What a colorful and extraordinary life he lived! Your never ending love and devotion to him was clear each time I saw you. May you find peace and comfort in your memories of that great love. My sympathies to all of the family in this time of great sadness and mourning. I remember Dr. Frame as being a very nice man, always polite and soft spoken. Our deepest sympathy Roxanne and family. Dr. Frame was an incredible person, friend and mentor, and taught us so much. He will always be in our hearts. Our deepest condolences to all of you at this sad time. We have wonderful memories of Hugh both at family gatherings and with the lab at Hepburn. He was a fantastic storyteller and had great sense of humor. It was an honor to work with him and he certainly sparked my interest in histology. My condolences to you all. So many good memories of when the families got together. Please know that we are all thinking of you at this time. conference weekends we had together. We are so sorry to hear about your dad’s passing. Please know our thoughts and prayers are with you at this difficult time. May you find peace and comfort in your happiest memories.